STATESBORO- RAYMOND, Mr. Robert Lee Raymond age, 79 passed into the serenity of our Heavenly Father on Monday, September 9, 2013 at Browns Health and Rehabilitation under the professional care of Hospice Advantage. 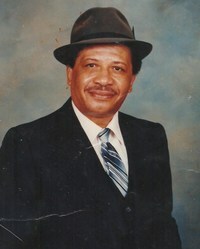 Mr. Raymond was born on September 16, 1933 to the union of the late Dan and Lela Raymond in Screven County, GA. He received his formal education in the Bulloch County School System in Statesboro, GA. He accepted Christ as his Savior at an early age and was united with Springhead United Methodist Church. He was united in holy matrimony with Petronia Jones on July 8, 1958 in Statesboro, GA.
Mr. Raymond was employed as a Custodian for Bulloch County Bank then later was employed by the Bulloch County School System, where he retired after many years of dedicated work and service. Because love is far greater than death he leaves to cherish his memory, two stepdaughters; Patricia Clark of Hempstead, NY and Gloria Lundy of Statesboro, GA; three step-grandchildren; one aunt, Ms. Tommy Lanier of Statesboro, GA; two sisters-in-law, Ms. Argentine Raymond Ward of Statesboro, GA and Ms. Lillie Mae Raymond of Statesboro, GA; a special caregiver, Mr. John (Pauline) Raymond of Statesboro, GA and a host of other relatives and friends. Homegoing Celebration for Mr. Robert Lee Raymond will be held 11:00 AM, Saturday September 14, 2013 at Greater Bethel A.M.E Church, 3 Peachtree Street, Statesboro, GA 30458. Minister Barbara Anderson, Officiating. Interment: Bulloch Memorial Gardens. Professional Services of Comfort Entrusted to Roberson Funeral Home of Statesboro.